Kicking off the first meeting of the first YBCA Fellows cohort (2016). More at ybca.org/initiatives/ybca-fellows. Event photography by Tommy Lau, tommylau.net. 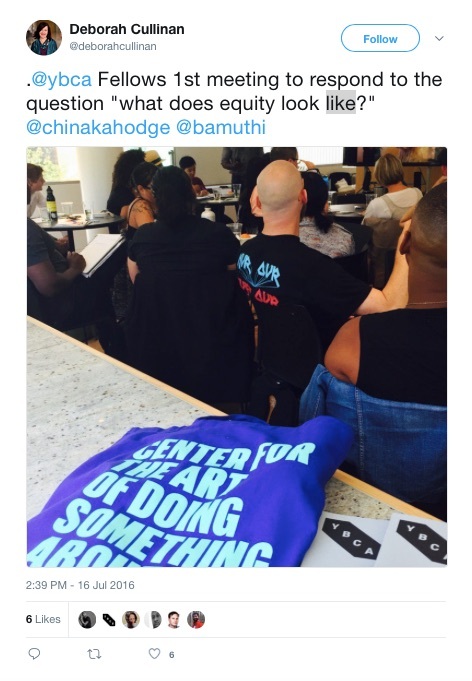 In July 2016, San Francisco’s Yerba Buena Center for the Arts gathered 30 artists, researchers, educators, tech workers, organizers, and lawyers to explore the question: “What equity looks like?” As part of the first year of the YBCA Fellows initiative, the Equity Fellows bridged different sectors, disciplines, political projects, and personal experiences. As they prepare for the Equity and Citizenship Public Square on August 19, in this post, Katherin and Trisha seek to understand their cohort’s process by reframing the central question as: “What does institutional access look like?” For this reflection they will share the process for self organizing among the Fellows, communication with the institution and staff, and how they came to the reframed questions. We all came to the cohort with different intentions. For some members of the cohort, this fellowship has been an opportunity to access YBCA, and for womxn, queers, and people of color to show that they can incubate and share their creative work in a prestigious arts institutions. 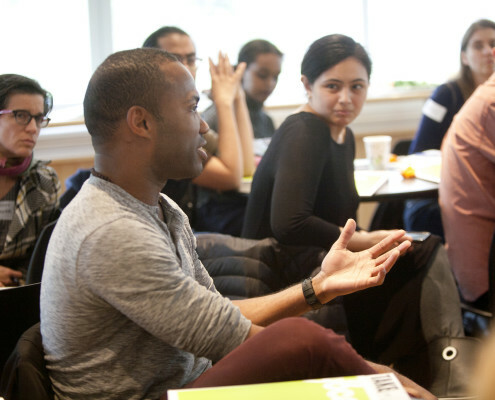 For others, this fellowship is an opportunity to hold YBCA, an institution more well-resourced than most community-based arts organizations, accountable to fulfilling its commitment to equity. Some fellows came into the program with projects they already wanted to share, others were more invested in collaboratively developing concrete answers on what equity looks like, and others sought to raise more questions through conceptual work, rather than provide solid answers. About six months into the program, after six meetings, there started to be tension between the cohort and the facilitation style, content, and highlighted projects/speakers that was brought in by the institution. At this time the cohort centered on the need to self-facilitate the remaining sessions and we quickly realized we needed more time for our version of equity to coalesce then be transformed into public programming. It really felt like we pushed back on the YBCA staff for this shift when our intention was to express our needs, which happened to be a different direction than the provided institutional format. This was the first overt expression of tension between the variety of relationships at play – the individual fellows to the group, the group to the YBCA facilitators/staff, and individual staff in relationship to their role as part YBCA, the institution. We can see this dynamic now: when we were in it, all we could feel was frustration at not being seen or heard. As part of this push and adaptation, the scheduled shifted such that we’d have our Public Square in conjunction with the “Why Citizenship” Cohort. For use this meant we’d have to be even more intentional about the path for audience participation, we want their experience to feel cohesive and expansive into the practices and concepts of Equity/Cultural Equity. As we approached the Public Square date we also realized that we hadn’t figured out the project budgets with an equity lens. This processed required us to balanced project feasibility, individual and group capacity, and equity in terms: of advocating for all participants to received stipends for their labor, making visible the “invisible” facilitation/coordination/group holding work that often non-binary, queer, and folx of color produced, ensuring that we respected our collaborators contribution to the event with appropriate compensation, and the admissions process for guests to experience the Public Square. We tried to be clear about the amount of financial and human resources a collective public program of this scale (focused on Equity and Citizenship) would need and presented that to the YBCA team. Another form of equity is acknowledging our work as cultural producers, organizers, artists, thought leaders [another word for this], is often severely undervalued and under compensated in that larger social realm. Through this process we wanted to ask if we could close that gap in “smaller” interactions, like sharing our full project budget with YBCA. Although we did not receive the response we hoped for, this did illuminate another dynamic to the question “What does institutional access look like?” This process reminded us that institutions excel at building surface, light touch relationships and for this cohort and THIS question “What does equity look like?” the foundation really is cultivating critical connections and moving at the speed of trust. 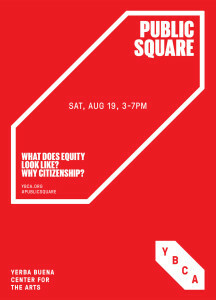 Please join us on Saturday August 19, 3pm-7pm for the Public Square showcasing the work of the Equity and Citizenship Fellows.